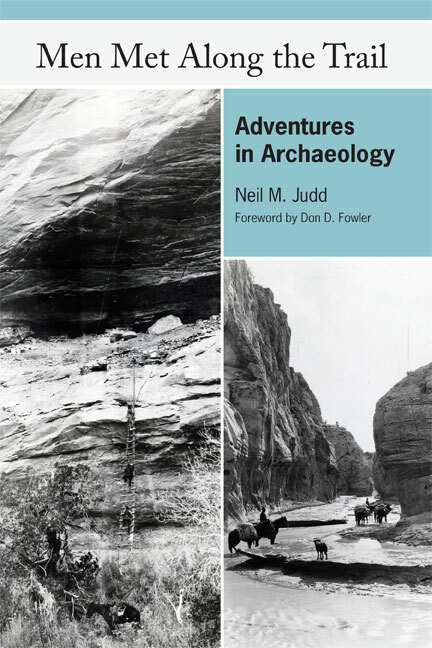 Originally published in 1968, this classic work by renowned archaeologist Neil M. Judd is a compilation of recollections and memories of his extensive career in archaeology. The stories told are truly those of “Men Met Along the Trail,” of the archaeologists, Mormons, Indians, prospectors, ranchers, and settlers that Judd encountered in his lifelong travels and work throughout the southwestern United States and beyond. There are meetings with leading American archaeologists such as “Dean” Byron Cummings, W. H. Holmes, and Charles D. Wallace, and famous Southwestern figures including Cass Hite, Dave Rust, and John Wetherill. Throughout are tales of early field work and typical camp life, from flooded canyons, run-ins with rattlesnakes, cumbersome pack trains, and early Model T Fords, to camp pranks, food shortages, and Zuñi dance celebrations. Written at the request of young associates who felt Judd’s lifetime of experiences in the field could be both instructive and amusing, Men Met Along the Trail provides a glimpse of archaeology when it was an emerging field of study, evolving from simple curio collecting to technologically advanced radiocarbon dating and pollen analysis. Featuring more than thirty original photographs and a new foreword by Don D. Fowler, this book is entertaining and informative, offering readers a vibrant and colorful picture of the adventures to be found in early Southwestern archaeology. Neil M. Judd (18871976) was a pioneer of Southwestern archaeology. He participated in 24 investigations and served 39 years at the United States National Museum, a unit of the Smithsonian Institute. He was the principle investigator during the excavations of Pueblo Bonito in Chaco Canyon. Don D. Fowler is the Mamie Kleberg distinguished professor emeritus of anthropology and historic preservation at the University of Nevada, Reno. His publications include A Laboratory for Anthropology: Science and Romanticism in the American Southwest, 1846-1930 and The Western Photographs of John K. Hillers: Myself in the Water.